You need a present, but you simply can't think of anything? 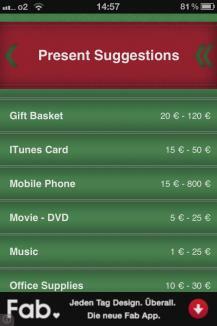 Then you need our present app! · For which gender are looking for a present? · How old is the presentee? 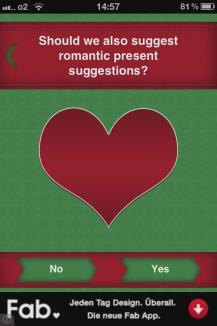 · Do you also want to get romantic present suggestions? · Should we also suggest creative presents? · What is the maximum amount of money you want to spend? As a result you get a selection out of hundreds of present suggestions. Have fun looking for presents!